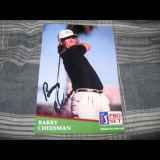 Barry Cheesman is an American professional golfer who played on the Nationwide Tour and the PGA Tour, before getting into golf he was a minor league baseball player. Cheesman was drafted by the St. Louis Cardinals in the 1977 Major League Baseball Draft with the 613th pick in the 25th round but never made it to the majors, spending four years in the minors. He was a catcher and a pitcher. He played for the Johnson City Cardinals of the Appalachian League and the Calgary Cardinals of the Pioneer Baseball League. He was traded to the California Angels organization in 1979 and played for the Salinas Angels of the California League. He was traded again to the New York Yankees organization in 1980 and played for the GCL Yankees of the Gulf Coast League. Cheesman called it quits after that season and became a golf professional in 1986. Cheesman earned his PGA Tour card for 1988 through qualifying school. In his rookie year on Tour he only made 6 of 30 cuts and failed to retain his Tour card. He joined the Nationwide Tour in 1990 and won the Ben Hogan Quail Hollow Open en route to a 13th place finish on the money list which earned him his PGA Tour card for 1991.